I would like to modulate from G major to c minor in such a way that it would be almost unnoticeable to the listener. I'm composing a piece in a style that's very Arvo-Pärtesque minimalist-sounding, so that does limit the chromatic/enharmonic options. The main difficulty seems to be that it's very hard to introduce the E flat without it sounding ever so slightly jarring. The other way round (going stealthily from minor to major) is much easier, for some reason. Within a minimalist sort of setting, one approach I might take would be to boil things down to just the root or root and fifth. If you have a long enough period of time where you don't have a third in the mix, your ear won't be glued to a given tonality and introducing the minor flavor into the mix shouldn't sound as abrupt. You can also start adding in the b7 of the original key before hitting the Eb. Since there is a major mode that has a b7 (Mixolydian), that is the only note that is present in the minor modes that is common with any major modes. I'm not familiar with Arvo-Pärtesque to be able to say whether or not this approach would be great in that context or not. Eb is certainly a foreigner in G major. To help the ear not to be surprised by it, you could use D# a couple of times as a chromatic passing note from D to E (D > D# > E) in preceding melody. This could be part of an innocuous harmonic progression like I-IV. You could then write a melodic fragment D -> Eb -> G, introducing C minor around G. You could tonicise it then and there, or later. I would recommend, as a general approach, looking at Max Reger's Modulation. C min is relative to Eb Maj, a cadence from GMaj to Eb Maj could be modified to move to C min in a fairly straight forward manner. Using the notes that make up Bo works well. Diminished harmonies are often used to move out of one diatonic place to another. Some of those work fine, even with just 2-note voicings. Emphasizing the leading tone resolution (B in to C) somehow can also help make the G, Cm change sound more deliberate. A modulation from G major to C minor would be a modulation to the subdominant. The interesting part is your concern about the tone E flat and the possibility it could be jarring. The vii°7 in G major is F#,A,C,Eb so you could use that to move into G and introduce the E flat. Something like G: vii°7 I Cm: V4/2 i6/3. Another possibility is to go to the major IV first then just lower the third to make it minor iv. If that is combined with the G7 you will get a nice chromatic descent F,E,Eb plus both work with the notion of altering tones by lowering them. Forgot to load an image yesterday. I added a third example trying out two converging chromatic lines. Modulations should make use of pivot chords to make the modulation smooth. A pivot chord(s) put simply is chords that fit in both the key you are modulating towards and the key you are coming from. so for instance, if you have a 4 bar phrase in C Major. Let say your phrase ends on an interrupted cadence. Now that six-chord of C major is an a minor chord, this is conveniently also the tonic chord of a minor. Both these chords are a suitable resolution to your cadence. Now we are in the second chord of your second four bar phrase now you can go to the d minor chord that is again both C:ii and a:iv this is the second pivot chord you can use. Then finally we would just have an E Major chord with a raised g# tha resolves correctly to now make it clear that we are in a minor. There is nothing that makes modulations as clear as Leading Tones resolving towards a Tonic. Some modulations lend themselves more towards the use of pivot chords than others but the modulation to the relative minor is an especially easy one to use them with. The progression I I7 IV iv is quite common. If you were to establish that as a pattern in G major, but gradually shift the rythmic emphasis away from the I and IV and toward the I7 and iv, then those two chords could come to be perceived as the V7 and i of C minor, without there necessarily having been any clear point where the piece switched key. 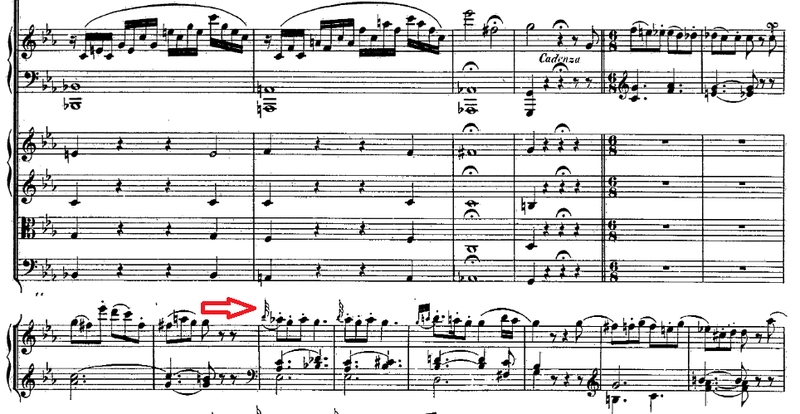 In case anyone's interested: I've solved, to my own satisfaction, the change of mode part of my question, in a rather unexpected way, by transitioning first to F sharp Aeolian. Of course, I'm still way off C minor, but modulating through minor-like modes and keys makes it easier (I hope). I think the main lesson here is that key transition doesn't necessarily involve advanced "chord magic" (although it can). Stylistically speaking, it's more about setting up proper expectations and then refuting those in a convincing way than anything else. The repeat bars all involve two repetitions instead of the usual one, by the way. The key of G major had been very firmly established beforehand. I want to end with a modulation from C minor back to D minor (hence the key signature), followed of course by a protracted cadence in that key. Not the answer you're looking for? Browse other questions tagged harmony modulation styles or ask your own question. Is this a V+ or III+6? Do Bach Chorales in minor keys ever modulate to the dominant major? How do I use the Omnibus Progression to Modulate from I to iv?